According to Dan Briody, author of The Iron Triangle: Inside the Secret World of the Carlyle Group, "It's not an exaggeration to say that September 11 is going to make the Carlyle investors very, very rich men." The Bush boys, Prescott, the two Georges and Jeb, are one of America's "dynastic families" in an America that is constitutionally banned from erecting an aristocracy. Others have included the Rockefellers, the Koch brothers, the Harrimans and the Kennedys. The Bush dynasty constitutes a de facto aristocracy with roots in the military-industrial complex and Saudi Arabia. If we were to choose a single determining factor in their ascent and the protective cover afforded the Bush family legacy, we would select the Bush boys' initiation into the secret society known as Skull and Bones, which is open only to specially chosen undergraduates at Yale University. The occult in America in so far as the ruling class is implicated in it, does not particularly excite the interest of the news media. Questions about the inordinate power of the Freemasons, the Ku Klux Klan (prior to the Civil Rights era), and organizations such as Skull and Bones, left, are dismissed as "fringe" topics unworthy of serious study by "respected" journalists and academics. During the iconoclastic frenzy that seized America and led to the toppling of numerous memorials to Southern Confederates, prominent statues like that of Confederate General Albert Pike, one-time Supreme Commander of Scottish Rite Freemasons, and 33rd degree Freemason and former Klansman Sen. Robert Byrd, were untouched. George Herbert Walker Bush, the 41st President of the United States, was the grandson of Samuel Prescott Bush (1863-1948), a protégé of Zionist banker Bernard Baruch. During the First World War, Baruch, as chairman of Woodrow Wilson's War Industries Board, appointed Samuel to the board, where he was responsible for choosing which munitions and weapons manufacturers would receive millions of dollars in government funds, thereby launching the Bush family's connection to the military-industrial complex. Following in his grandfather's footsteps, George H.W. Bush was a principal member of the "Carlyle Group" investment house which reaped a financial windfall from the 9/11 terror attack and George W. Bush's invasion of Afghanistan and Iraq. Sen. Prescott Bush (R-CT) was the father of George H.W. Bush. Commencing with him, the Bush dynasty ascended from the world of politics, war-profiteering and business with the Harrimans and Rockefellers, to the unfair advantages to be gained over one's fellow Americans by membership in a secret society. Prescott was initiated into the Skull and Bones in 1916. In 1918, nine years after the death of the guerrilla-fighter Geronimo at Fort Sill, Oklahoma, where the renowned Native American had been held as a prisoner of war, Prescott Bush and a small team of fellow Bonesman, entered the Indian cemetery there and robbed a grave. The presumption is that they were seeking Geronimo's skull. One debate turns on whether they obtained his skull or that of another Indian. The corporate media have spread a protective cloak over this shameful episode and with their usual disinterest in matters embarrassing and deflating to our dynastic overlords, have denounced it as a "conspiracy theory" and a "discredited rumor." For those willing to question the authority of the corporations who own the media and dare to think for themselves beyond the hoodwink, there is evidence that a group of Skull and Bones members including Prescott Bush, did indeed rob and desecrate a grave at Fort Sill. The starting point for an investigation would be the May/June 2006 issue of Yale Alumni Magazine, which is devoted in part to a recently discovered letter of June 7, 1918, from Bonesman Winter Mead to Bonesman F. Turbee Davison mentioning the grave-robbery. The fact that no investigation of this and other leads has been undertaken is no grounds for dismissing with a smirk the likelihood that the father of the 41st President of the United States was an occult ghoul. President George H.W. Bush was distinguished by his unwavering allegiance to the kingdom of Saudi Arabia, including the family of Osama bin Laden. George H.W. arranged for his son George W. to enter into a business partnership with Salem bin Laden, Osama's brother, allegedly using Houston entrepreneur James Reynolds Bath as a go-between. Bin Laden's money temporarily helped to rescue Bush's failing, Texas-based Arbusto Energy company, from insolvency. On May 29, 1988, Salem was killed in Texas in what was officially described as a "freak accident" when the plane he was flying "drifted into high voltage electrical lines" northeast of San Antonio. The National Transportation Safety Board did not conduct an accident investigation. According to reporter Robert Scheer, "George H.W. Bush was a highly paid consultant to the Carlyle Group, a $12-billion investment firm heavy into the defense and energy games. Carlyle's chairman, Frank Carlucci, who was Reagan's Defense secretary, (was) a close friend of Donald Rumsfeld...The Carlyle company roster also include(d) top vets of the (George H.W.) Bush administration, led by ex-Secretary of State James Baker, a political gunslinger who worked hard on George W. Bush's post-election campaign to secure Florida's electoral votes and the White House. In fact, the government alums in the Carlyle Group are so well connected internationally that, until Sept. 11, the group was even trusted to invest the funds of the Bin Laden family..." (Los Angeles Times, February 19, 2002). After the election of George W. Bush as President, in Saudi Arabia, the Saudis hosted his father and his father's partners in the Carlyle Group and conveyed to them new contracts based on oil wealth. Former President George H.W. 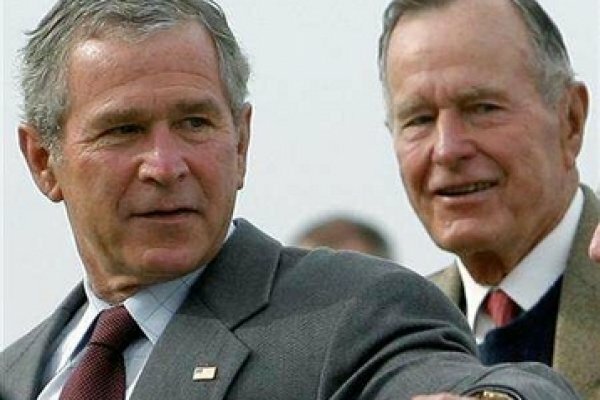 Bush and President George W. Bush protected key Saudi principals from investigation in connection with the massacre of Americans in New York on September 11, 2001. In the immediate aftermath of the terror attack, while flights in American airspace were restricted, George W. Bush facilitated the departure of approximately 300 Saudi nationals on fifty-five separate flights. Among these were 24 members of the bin Laden family, as well as Prince Ahmed bin Salman, an intermediary between Al Qaeda and the House of Saud. (cf. Craig Unger, "The Great Escape," New York Times, June 1, 2004, p. A19). "Carlyle and its network of investors are well positioned to cash in on Bush Jr.'s expansion of the defence and Homeland Security department budgets. Two Carlyle companies, Federal Data Systems and US Investigations Services, hold multi-billion dollar contracts to provide background checks for commercial airlines, the Pentagon, the CIA and the Department of Homeland Security. USIS was once a federal agency called the Office Federal Investigations, but it was privatized in 1996...and was soon gobbled up by Carlyle...USIS now does 2.4 million background checks a year, largely for the federal government. Another Carlyle subsidiary, Vought Aircraft, holds more than a billion dollars in federal contracts to provide components for the C-117 transport plane, the B-2 bomber and the Apache attack helicopter. Prior to 2001, Vought had fallen on hard times. Just before the 9/11 attacks, Vought announced that it was laying off more than 1,200 employees, more than 20 percent of its workforce. But business picked up briskly following the airstrikes on Afghanistan and the war on Iraq" (Jeffrey St. Clair, "When War is Swell: the Carlyle Group and the Middle East at War, CounterPunch, September 6, 2013). Tim Russert: "You were both in Skull and Bones, the secret society." President George W. Bush: "It's so secret we can't talk about it." The ubiquity of this secret society was highlighted in the 2004 Presidential election campaign when both candidates of America's two major political parties were members of the same secret society. Democratic candidate Sen. John Kerry had been initiated into Skull and Bones in 1965. Heads they win. Tails we lose. Almost none of the preceding facts will be broached by the System's media in the days ahead, as the late President Bush is elevated to the pantheon of American statesmen and heroes in tediously toadying eulogies and extravagant funerary rites. The old Pharaoh is dead. His skull and bones will endure in more ways than one.